HALIFAX/PLYMPTON– For weeks appointed and elected officials in both Halifax and Plympton have been attempting to deal with a “menacing” dog, living at a residence in Plympton adjacent to the Halifax/Plympton border which abuts the Winnetuxet Children’s Place preschool, which is on the Halifax side of the line. 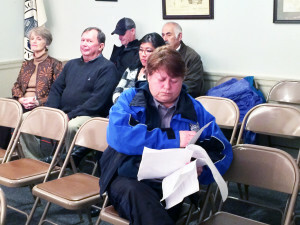 Halifax Animal Control Officer Noreen Callahan carefully reviews her notes prior to a Dog Hearing held before the Board of Selectmen. Photo by Abram Neal. As Plympton has no leash law, Frank Bush, the Plympton Animal Control Officer expressed in a letter to Selectmen that he believed that there was nothing he could do, and encouraged Plympton to pass a leash law. The Plympton ACO, after some prompting by Plympton Selectmen, on Monday put a 14-day restraining order on the dog, requiring it to be under the control or direct supervision of its owners at all times. This is not the first time a restraining order has been placed on this dog, according to Plympton records. Several days before the restraining order was placed, Bush received a letter from the Halifax Town Administrator, Charlie Seelig. Although dated late December, it clearly outlined the Halifax Board of Selectmen’s complaints, and how Plympton might address them under Plympton’s own bylaws. Believing that Bush had already received the letter, as the Selectmen had, Plympton Selectmen Chairman Mark Russo complimented Seelig’s letter for its clarity and the direction it gave Town officials. But on Tuesday, Bush rejected the letter from Seelig, asserting that Halifax had not filled out an official complaint form and therefore he could again do nothing more than what he had already done. Seelig takes the position that Plympton does not have an official complaint form, that it is simply a generic form from the state. Regardless, Russo personally rushed the form to Seelig. Russo has expressed that he wishes for the matter to be dealt with promptly, and hopes to hold a dog hearing at the Plympton Board’s meeting on Jan. 25. In order for this to happen, though, a certified letter to the owners of the dog must be sent by Friday. On Tuesday, Halifax ACO Noreen Callahan stated that she regularly patrols the area, but cannot take action unless the dog is caught across the border, physically in Halifax. At that point she could start an investigation. The matter remains ongoing as of press time, and may very likely continue on for several more weeks.